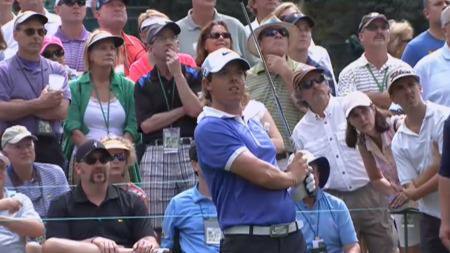 Rory McIlroy’s level par 72 was the best Irish score of the day at Augusta NationalRory McIlroy and Graeme McDowell refused to push the panic button on a black day for the Irish on Augusta’s infamous greens. “When I look back at it, it was all short game,” the Dubliner said after seeing a promising round slip away on and around the greens. One under par after saving a brilliant par at the fifth by hacking out of the pin straw on the right and getting up and down with a sensational wedge to 18 inches, Harrington double bogeyed the sixth, made another great up and down for par at the seventh but then got zero momentum after that as he added just one birdie to five bogeys and a double bogey six. “I missed a few shots,” said Harrington, who had three-three putts and dropped three shots at this last two holes. Five shots outside the top 50 and ties who will make the cut tonight - there is also the 10-shot rule - he looks unlikley to make the cut after racking up a double bogey six at the 17th and a bogey at the last. Graeme McDowell piches close for birdie but made some sloppy bogeys and a careless double bogey in the first round.While the drove the ball very well at times and hit some wonderful approach shots, McIlroy’s lack of tournament sharpness caught up with him as he went out in two under and came home in two over for a 72 that left him tied for 34th. Five birdies and five bogeys told the story of an up and down day for the 23-year old world No 2, who confessed that he made too many sloppy mistakes on a course that punishes imprecision like no other. Two under after birdies at the second and par-three sixth, he bogeyed the tight seventh off a perfect tee shot, bunkering his approach but got that shot back with a sublime approach to six feet at the ninth. But he then turned in a disappointing 38 on the back nine with bogeys at the 10th, 12th (three-putts), 14th and 17th cancelling out birdies at the 13th and 15th. McDowell made a fine start by following four pars with a birdie from six feet at the tough fifth but then bogeyed the sixth and birdied the eighth to turn in 35. A double bogey five at the 12th, where he tried to putt from just off the back of the green but took four to get down, made him furious. But he kept his composure, two-putting the 13th for birdie before getting up and down from short of the lake at the 15th for another birdie to get back to one under before dropping shots at the last two holes. 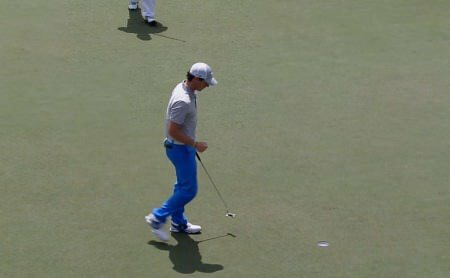 Rory McIlroy sets up a birdie with this brilliant approach to the ninth. But the back nine would prove to be a disappointment.“You know, I played some solid golf to be honest, apart from taking four to get down from over the back of 12, which is just sloppy,” McDowell said. “Rallied nicely, birdied 13, birdied 15, chances coming in. he then bunkered his second to the 18th and dropped another shot to find himself hovering on the cut line in joint 46th on one over. “The 18th was disappointing. It was an easy enough trap shot there and I just came out of it a little bit. All in all, some good ball‑striking today. Iron play was solid. A couple nice scrambles here and there. McDowell has worked hard to get his short game in shape over the winter but found Augusta to be as unforgiving as ever with slightly hairer lies around the greens making life more difficult at times. “For sure, what they have done here at Augusta, they have given you a little bit of grass to play with around the greens. Seventy percent of the time, it makes it quite easy. “But on 12, I didn’t have a lot of green to work with, quite a fast pitch shot. You know, I’ve been practicing hitting the putter, trying to nudge it through the fringe and get it up on the green. And the fringes are very slow to putt through, and it makes it difficult. Trying hard to look for positives, he said: “Yeah, no panic button. I didn’t play terribly at all today. Hit a lot of nice shots. A couple putts that could have went in here and there. “Six was my only mistake on the front nine, and 12 was disappointing and the last two, but there was plenty of good there. Some nice birdies, nice swings. Given the way he finished, the former US Open champion was remarkably even-tempered about his day. Harrington also paid a high price for his mistakes, having played very well early in the day. A birdie from 10 feet off a booming drive at the third got him up and running and he was unlucky not to crown the ridge at the fourth and give himself another 10 footer for birdie there. At the fifth, he carved his tee shot into the trees but squirted a five wood to within 100 yards of the green and hit his third stone dead to salvage a brilliant four. With the pin on the top tier at the par-three sixth, he missed the green to the right and faced a tricky chip with the ball above his feet on a mound. But he didn’t give it enough and saw it bounce in the first cut, kick left and then take the slope, finishing off the front edge of the green from where he three-putted, leaving his tough uphill putt nearly 10 feet short. He mis-read that putt but made amends at the seventh where his tee shot finished up against a tree in the right rough. Forced to chip out, he hit a good second around 18 feet above the hole and holed the slippery downhill putt. But he couldn’t back it up with a birdie at the eighth, where he hit a delicious pitch to six feet. It was all about momentum and he simply couldn’t give himself any when he was on or around the greens. After missing the green right at the ninth, he tried to cut up a pitch but made it only as far as the edge and dropped another shot to turn in two over. A bogey at the 12th, where he stood off his tee shot, bunkered it and failed to get up and down, left him facing an uphill battle. After two putting the 13th for birdie to get back to two over, he still felt he had a chance to salvage the round but it went the other way instead. “The 14th was the one,” he confessed. “In my head I am birdying 13, 14 and 15 to get back to level and it looked like I hit it in close there and end up making bogey (with a three-putt). “I take three from the edge on 15 (for par) and shouldn’t have hit it over the back on 17 off a decent tee shot, trying to come up short and right but hit it too hard and another three putt as well. A number of misreads and short putts missed and you need to be holing them for momentum. It was a tough day after that. Bad shot on six, straightfowrard shot. When I look back at it, it was all short game. Twelve months ago Rory McIlroy’s coach floated among the Georgia pines without a care in the world and watched his young pupil paint the blank canvas that Augusta National had presented him on his Masters debut with brushstrokes of genius. This week, things were very different. Michael Bannon beetled along the rope lines, looking back frequently to see where McIlroy’s tee shot had landed, his face creased with concern at times. There were few smiles as he peered through his binoculars at the player he’s guided since he was a four year old. Graeme McDowell wants Augusta to get firmer and faster despite battling on “marble staircase” greens to open his Masters challenge with a level par 72.